Imagine combining a choir and ukulele orchestra with musical theatre experience from “Hair”! The Ukastle Ukestra plays original arrangements of songs taken from all genres but send them to new places and back again by arranging them for ukulele and voice. 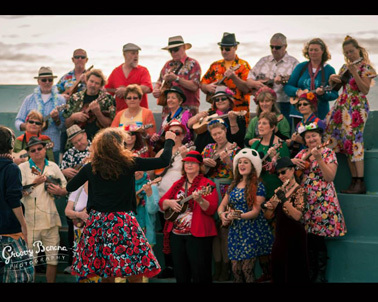 This motley group of performers have been entertaining audiences from Melbourne, Brisbane, New Zealand and even Hawaii for over seven years. We believe in giving a show, more than just a collection of songs!